Perrycroft was designed by the Arts and Crafts architect CFA Voysey in 1893, and completed in 1895 for Midlands industrialist John William Wilson MP. Designed primarily as a summer retreat, the house and garden in its hillside setting encapsulate the romantic ideals of Edwardian country life. John Wilson was one of the early enthusiasts for the magnificent splendour of the Malvern Hills, and in 1893 he bought a stretch of land on the western slopes, commissioning Voysey to design a small country house with lodge, stables and coach house in this remote and then rather inaccessible place. 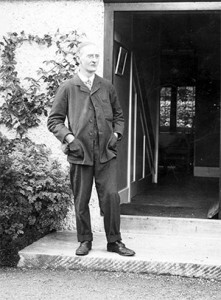 Perrycroft was the first major commission for Voysey, and one which helped him to develop his style as an architect and establish his reputation. An early photograph showing Perrycroft House just built and surrounded by open fields. Voysey was born in the east Riding of Yorkshire where his father, the Rev Charles Voysey, ran a school. Voysey’s father was himself the son of an architect and was descended from John Wesley’s sister (Voysey used to claim he bore a resemblance to Wesley), which may explain the tradition of dissent which ran in the family. When Voysey was fourteen his father was expelled from the Church of England in one of the great ecclesiastical scandals of the nineteenth-century. His heresy was that he did not believe in the doctrine of eternal damnation or, as his son put it, ‘he believed in a good God rather than an angry one.’ After a trial in the House of Lords, where Voysey’s father was defended by some of the nation’s most respected figures, who were also friends – Darwin, Ruskin and Huxley among others – he founded what he called the Theistic Church in fashionable Piccadilly, and for forty years he was regarded as a pioneering preacher whose sermons were published and widely distributed every week. The message was one of ‘sweetness and light’ – God was Goodness and man had evolved through a kind of spiritual Darwinism to a higher state of love and compassion. The influence of his father and his father’s experiences on the young Voysey cannot be over-stated. As John Betjeman said: ‘What his father preached to thousands in London, Mr Voysey has interpreted in stone and colour.’ The new church attracted an enthusiastic following among the well-connected educated liberal middle-class and may well have helped the young Voysey into his early apprenticeships and, in time, into meeting his first clients. One such client may well have been John William Wilson, who asked Voysey to design Perrycroft. Just as with his clothes so too with his buildings. Voysey designed his houses free of Victorian nooks and crannies and any unnecessary ornament that was likely to gather dust. For information about visiting the House please see our Visiting page.